Why become a Community Health Mentor? This unique program allows you to share your health story with the next generation of health care professionals. Through the program, you will meet with a group of health professions students approximately every six weeks for one and a half to two hours, over the period of one year. In that time, you will talk with students about your life, your health history, your personal experiences in/with health care, what you consider the makings of a good health professional, as well as what your insurance does and does not pay for. These discussions are meant to foster meaningful relationships with students, engaging them in firsthand, real world health care experiences. *This program is for students in training at Arizona State University, Northern Arizona University and the University of Arizona College of Medicine – Phoenix​. What does a Community Health Mentor receive? A nutritional and home safety assessment. Advance care planning and community resources. Who can be a Community Health Mentor? Heart disease, high blood pressure, lung disease, diabetes, kidney disease or arthritis. Able to make a two-year commitment. Must have a primary care provider. Must be available on Wednesday afternoons. Must live or be able to travel within 25 minutes of Downtown Phoenix. For information on how to become a Community Health Mentor, please contact us or fill out the interest form. The Health Insurance Portability and Accountability Act (HIPAA) does not directly apply to the Community Health Mentor Program as students are not providing medical care. However, students must maintain the privacy and confidentiality of your information, including your health-related information. 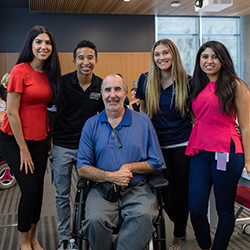 A new program is testing students’ ability to work with interprofessional teams to solve cases that involve rare diseases/bioterrorism.